Get ready to see hundreds of vendors selling all different kinds of unique antiques and collectibles at the Antiques & Collectors Extravaganza. This exciting event takes place from April 25th to the 27th at Renningers Kutztown location in Pennsylvania. The show opens Thursday from 10am to 4pm, and continues Friday and Saturday from 8am to 4pm. 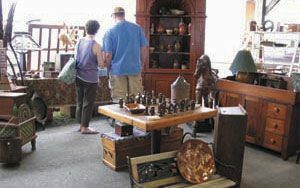 Renninger’s Antiques and Collectors Extravaganza events are held every April, June, and September on the last full Thursday, Friday, and Saturday of the month. The show grounds are behind Renninger’s Antique & Farmer’s Market in Kutztown, PA. Many exhibitors set up shop outdoors, under tents, and in the two large pavilions, and the Indoor Antique Market and Farmer’s Market are also open during the event. If you want to enjoy this Extravaganza for the entire weekend, then you’re going to want to get there early on Thursday, as the entrance usually piles up with customers waiting to find a good bargain. As you walk through the vendor isles filled with furniture, home decor, collectibles, and other exciting items, sellers encourage their customers to ask questions about the merchandise, so make sure to take your time and enjoy browsing! For sellers interested in becoming a vendor at this popular event, be sure to fill out the exhibitor contract at files constantcontact.com or call 570-385-0104 for more information.